Some of the major players of nanophotonics market are Samsung SDI, IBM, Blue Nano, JDSU, Carbon Solutions, BuckyUSA, Catalytic Materials, Cambrios Technologies, Cree, Cnano Technology, Nanocs, LG Display, Nanoco Technologies, Nanocyl, Nanosys, nanoPHAB, OSRAM Opto Semiconductors, Nanostructured & Amorphous Materials, QD Vision, Philips Lumileds Lighting, TCL Display Technology, Quantum Materials, and Universal Display among others. These players are set to power the global nanophotonics market. 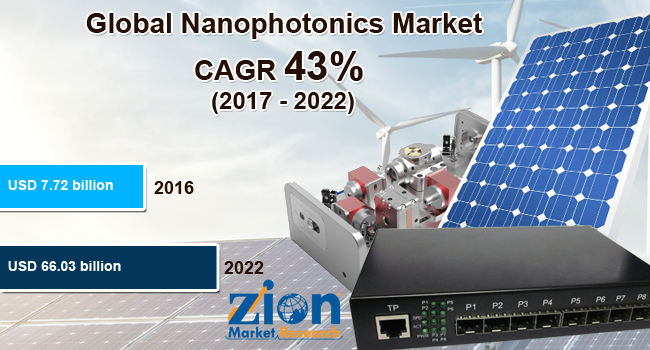 According to the report by Zion Market Research, global nanophotonics market was capitalized at almost USD 7.72 Billion in 2016 and is likely to cross almost USD 66.03 Billion in 2022, developing at a CAGR of slightly more than 43% from 2017 to 2022. The nanophotonics market is significantly boosted by nanophotonics LEDs that is having biggest market share after UV LED. So as to attain higher bandwidth and faster data transmission speed, many players are using nanophotonic technology by integrating electronics & photonics on the same processor. On the other hand, the difficulty in maintaining precise current, high price of raw materials, and heat management are hindering the growth of nanophotonics market. Nevertheless, rising requirement for flexible & thin displays, cost reduction, and improvements in technology have led new opportunities in nanophotonics market. In addition to this, various R&D activities by government and academic bodies is set to bolster the nanophotonics market growth. For example, in June 2018, EPFL researchers designed a unique system that can be employed for analyzing & detecting molecules with extreme level of high precision that too without employing any bulky tools. This latest development craves the path for image-based, large-scale detection of materials supported by AI. This helped in boosting the nanophotonics market. Nanophotonics market is divided into applications, product ingredients, and region. Product wise the nanophotonics market is further divided into OLED, LED, photovoltaic cells, NFO, optical switches, optical amplifier, and holographic data storage system. On the basis of ingredients employed in nanophotonics tech, the nanophotonics market is divided into plasmonics, photonic crystals, nanoribbons, nanotubes, and quantum dots. Nanophotonics market has wide series of applications in material science, consumer electronics, nonvisual applications, nonvisible wavelength instruments, and indicators among others. Area-wise the nanophotonics market is divided into 5 regions such as Europe, North America, Latin America, Asia Pacific, and Middle East & Africa. The biggest are for nanophotonics market exists in North America after Europe. The raw materials investment and low labor costs in Asia Pacific have assisted them to rule the nanophotonics market to a greater amount.